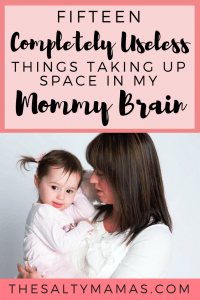 I have a bad case of Chronic Mommy Brain. For three weeks in a row I came thisclose to forgetting my sons swim lesson. At the same date and time that it’s been for almost a year. I wish that was the only time that Mommy Brain reared it’s ugly head, but it’s not. At this point it’s chronic. I brew a cup of coffee that I forget to drink. It took me weeks to remember to make my kids their dentist appointment. My life is full of lists of things to do. It used to be because of the sense of accomplishment I’d feel crossing things off the list. Now it’s legitimately because I will not remember if I don’t write it down. Why? WHY?? Surely it’s not because old age has begun to wreak havoc on my mind! I’m 35 – though if you ask me there’s a 97% chance I’ll say I’m 36 because I have FORGOTTEN MY OWN AGE. And I’m not pregnant – knock on wood – which has been my go-to excuse for the past 5 years. So what is it?? Cole: Will you read me the Jesus book, Daddy? Daddy: Sure, buddy. You love this book don’t you? Cole: Yeah, it’s my favorite. Me: Well we’ll have to thank the Sanford’s when we see them at church. Me: Because they gave Cole that book! Me: At Cole’s baptism party. Daddy: When he was three months old? How do you remember that?? Me: Because my job is to remember all this nonsense. And I do. Lucky for me, I don’t feel so alone, because Jaymi does the same thing. Which made me think….you probably do it too. The telephone numbers and addresses to every place I’ve ever lived. And my parents. And my grandparents. The term “Golden Birthday,” what it means and when it will happen for each of our kids. And yes, we’re already thinking about how we can make them extra special. I mean, Abe’s will be here in three more years! The date of my prom. 18 years ago. (June 3rd in case you were wondering). That “Go Go Power Rangers – Redux” (Cole’s once favorite song to listen to on Alexa) is credited to Ron Wasserman. The dates of random holidays that aren’t even real, like National Margarita Day or The Sweetest Day. To whom should receive credit for which tagline from every season of Real Housewives of Beverly Hills, New York and New Jersey. (And let’s face it, most of the others, but I don’t want to get too cocky). The lyrics to every sitcom we ever watched in the ’90’s. How to make a recipe paleo, even though keto is the new thing. The height requirements for every ride at Disneyland. What outfit my girls wore on each holiday, and who gave it to them (if applicable), so I can send them a picture of my kids wearing said dress. The general knowledge to win any game of Saved by the Bell trivia you could throw at me. How old my son will be when his birthday falls on Easter. In 2026. What’s your random fact taking up precious brain space? HAHA, my golden birthday was also my 21st birthday! So, I was at a bar with a feather boa. Naturally. I can discern which obscure children’s show my daughter is referring to with just a character name. This stuff takes up waaaay too much space!! Oh man. Sooo much useless knowledge in my head. I could tell you the plot and book number of probably every single Baby-Sitters Club or Sweet Valley High book, but basic mental math? Forget about it. Mom Brain to the max!